Sometimes the holiday season can get more hectic than relaxing and enjoyable. When you’re hosting family or friends in town for the holidays, it can become overwhelming on how to entertain your guests. 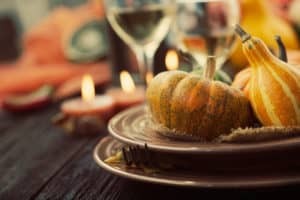 Below are a few ideas during the Thanksgiving season, when hosting friends or family, to make this time as enjoyable for both you and your guests. Christophe’s To-Go – Christophe’s delivers right to your door on Thanksgiving morning. No shopping, no cleaning and no cooking. Get full meals or you make the turkey and let Christophe’s deliver the sides. These include cornbread stuffing, green bean casserole, asparagus and mushroom casserole. Smoke Ring – Smoke Ring is offering 14-pound turkeys with gravy for $75. Choose your favorite Southern sides including collards, Brunswick stew, bacon and blue cheese potato salad, cornbread and more. Paces & Vine – Join this great Vinings restaurant for their first Thanksgiving Day buffet. $29 for adults and $12 for kids under 12. Atlanta’s Turkey Trot – Kick off your Thanksgiving with the Thanksgiving Day Half Marathon, 5K. Runners and walkers will earn their turkey as they finish their race under Atlanta’s iconic Olympic rings. Holiday Lights – Atlanta Botanical Gardens – Once Thanksgiving is over, everyone starts getting ready for Christmas. Take your guests to see the magnificent holiday lights at Atlanta’s Botanical Gardens! Black Friday Shopping – Get your Christmas shopping done early by taking advantage of the great retail and boutique stores across the metro area. This is the time to find the best deals all year long! Enjoy your Thanksgiving with your friends and family! As your real estate family, we wish you a time of laughter, love, happy bellies, and ever-lasting memories.